The number of Marine Corps aircraft ready to fly on any given day has plummeted nged in the last seven six years, leading to serious questions about the safety of the service's aircraft as leathernecks continue to wage war on terrorists and respond to crises around the world. ; and service officials and lawmakers agree that budget cuts are to blame. 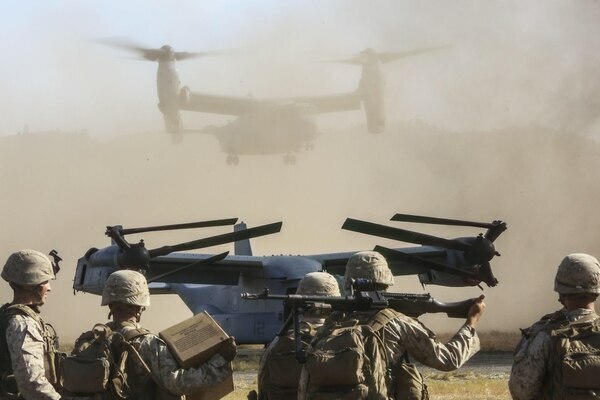 Mission-capable rates for all but one of the Marine Corps' 12 fixed-wing, rotary and tiltrotor airframes have fallen since the end of fiscal 2009, according to data obtained by Marine Corps Times via Freedom of Information Act request. While officials stress that the number of flyable aircraft fluctuates daily, the downward trends have alarmed Marine leaders and members of Congress. Of the Marine Corps' 276 F/A-18 Hornets, only 87 are currently flyable, Marine Corps officials said on April 20. That is less than one-third of all the service's F/A-18A-D variants that can be used to strike the Islamic State group, provide close-air support or fly reconnaissance missions. By comparison, 73 percent of F/A-18As were mission capable in fiscal 2009 along with 77 percent of the C-variant and 76 percent of F/A-18Ds, according to information provided by the Marine Corps. Marine helicopters have seen the biggest drop in readiness. Currently, o Only 42 of the Marine Corps' 147 CH-53E Super Stallions are flyable, or about 28.5 percent of the CH-53E fleet, according to Marine aviation officials at Headquarters Marine Corps Aviation. At the end of 2009, the CH-53E's mission-capable rate more than doubled that was at 63.6 percent, with 39.1 percent of the helos fully mission capable. 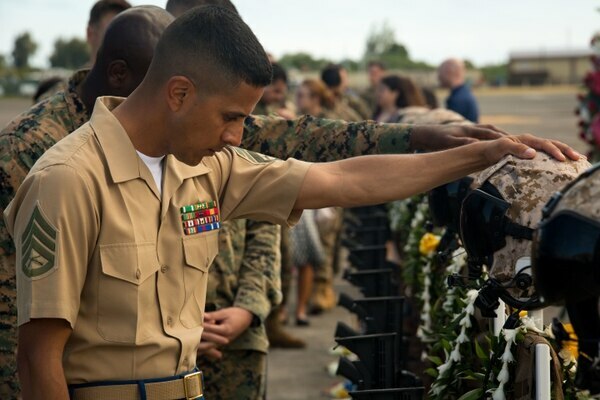 Marines pay their respects during a memorial ceremony honoring the 12 members of Marine Heavy Helicopter Squadron 463 killed in a January crash. As the Marine Corps figures out how best to meet its missions overseas, those left in the rear are flying less — and that has leaders, former pilots and members of Congress concerned. Marine aviation-related deaths hit a five-year high in September when fatalities reached 18 during the first nine months of 2015. About four months later, a dozen more Marines were killed when two CH-53E Super Stallions crashed off the coast of Hawaii. They were assigned to Marine Heavy Helicopter Squadron 463, and their commanding officer had been was relieved of command three days prior. A Marine familiar with the situation there told Marine Corps Times following the crash that the squadron as a whole was "way, way low" on flight time, adding "they were not flying enough." Retired Navy Cmdr. Chris Harmer, a former HH-60H Seawhawk instructor pilot, says said steep federal budget cuts are to blame. There's a direct line between flight hours and mishaps, he said. "For a given population of pilots — aviators," he said, "the less they fly, the less training missions they get, the less training the aviation maintenance personnel get, the less money we have for spare parts, the less money we have for training exercises, the higher the mishap rate will be if everything else is held constant." Marine CH-53E pilots averaged about 10.7 flight hours over the last 30-day reporting period, said Capt. Sara Burns, a Marine Aviation spokeswoman. Between Feb. 18 and March 18, Hornet pilots were averaging about 8.8 flight hours, she said. That was a little more than half theThe service’s goal was to give F/A-18 pilots 15.7 flight hours the Marine Corps wanted to give F/A-18 pilots during in that time period. 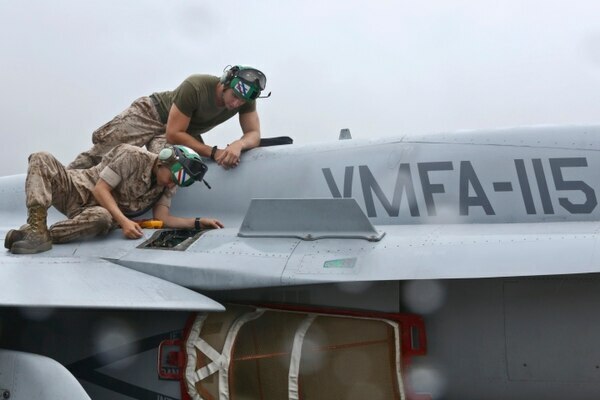 Marines troubleshoot issues with an F/A-18 Hornet engine. Fewer Hornets were mission capable at the end of fiscal 2015 compared with rates seven years prior. As a former instructor pilot, Harmer said ideally, the believes that pilots should fly between 25 and 30 hours per month, he said. Averaging eight or nine hours a month could lead to fatal mistakes, he warned. "Fifteen hours a month for a Hornet, to me that's the absolute hard deck," he Harmer said. "You're increasing risk with every hour beneath that. Eight hours a month, that's completely irresponsible, completely unsustainable. You're going to kill a lot of people if that's the new norm." Burns said Marine aviators' flight hours vary. Those gearing up to deploy are likely to have all or most of their aircraft in working order and tend to fly more. The number of flight hours that Marine pilots receive varies depending if they are preparing to deploy, Burns said in an email. Marine All-Weather Fighter Attack Squadron 533, for example, is set to deploy. All 12 of that squadron's aircraft are flyable and pilots averaged 10.8 flight hours in the last 30-day reporting period. Meanwhile, Marine Fighter Attack Squadron 312, a South Carolina-based unit that's currently stateside, has just three of its nine aircraft ready to fly. Its pilots averaged 4.5 flight hours in the last reporting period. Following the fatal helicopter crash in Hawaii, Assistant Commandant Gen. John Paxton ​told lawmakers in March that the Marine Corps is examining whether lower readiness rates have led to more aviation mishaps. A Marine CH-53E Super Stallion assigned to the 15th Marine Expeditionary Unit, departs the amphibious assault ship Essex. "We're looking to see if there's a linear correlation," Paxton said. told the Senate Armed Services Readiness Subcommittee on March 15. "We know historically that if you don't have the money and you don't have the parts and you don't have the maintenance, then you fly less." That same day, Sen. John McCain, R-Ariz., went as far as describing the Marine Corps' aviation problems as a "crisis." "Many aircraft are down hard, pilots are not flying, and non-deployed Marine aviation squadrons are short of the number of aircraft needed to train or respond in a crisis," said the chairman of the McCain said at a March 15 Senate Armed Services Committee and veteran Navy pilot. A top lawmaker was recently up in arms when he said he learned that Marine aviation squadrons are using parts from museums in order to keep their aircraft flying. "I have heard firsthand from service members who have looked me in the eye and told of trying to cannibalize parts from a museum aircraft … getting aircraft that were sent to the boneyard in Arizona back and ready to fly missions, pilots flying well below the minimum number of hours required for minimal proficiency," said House Armed Services Committee Chairman Mac Thornberry, R-Texas, at a March 22 hearing. The Marines were eventually able to While the Marine Corps does occasionally scrounge for parts from old aircraft, in the case cited by Thornberry, Marines were able to make the part they needed using a 3-D printer, said Lt. Gen. Jon Davis, deputy commandant for aviation. "Marines will find parts." Davis told the Senate Armed Services Seapower Subcommittee on April 20. "They will find them on other airplanes and cannibalize. We don't want them doing that." 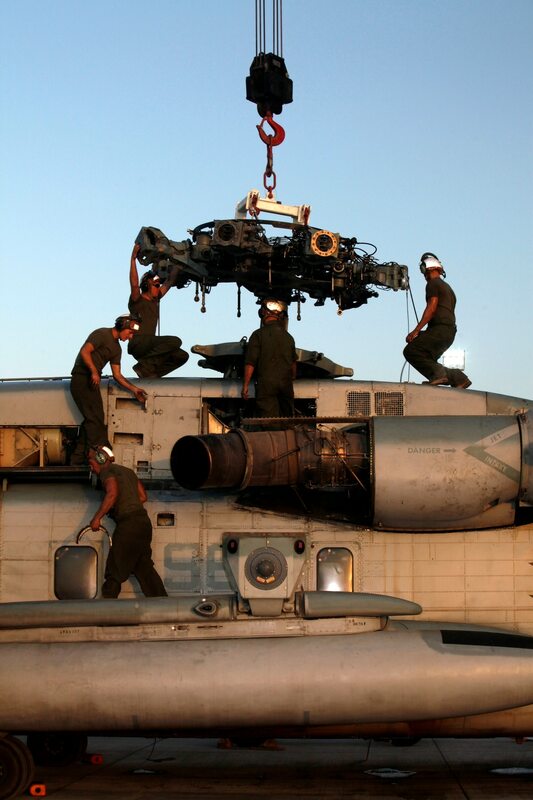 Marines fix a pair of CH-53E Super Stallion helicopters. Mission-capable rates on the heavy-lift helos are on the decline. To help restore the CH-53E fleet's pre-war condition, Congress has provided the Marine Corps with $360 million to refurbish and repair all of the service's 147 helicopters, said Salene, the MAG-29 commander. "The second part, staying on step, is working with all of the naval aviation team to ensure we have the parts we need, the aircraft we need and most importantly, the training we need for our people so that we can remain America's 911 force," he said. But getting spare parts is a challenge, Burns said. And when a fleet of Marines is competing for the same parts, the winner will be the unit closest to deploying. "We do not have enough ready basic aircraft," she said. "That means we are not getting enough flight hours and we aren't up on our maintenance requirements for those specific aircraft." The Marine Corps has requested another $460 million from Congress next fiscal year to address readiness shortfalls. Some of that money would buy spare parts for Marine aircraft. "We know we're under resourced for spare parts," Lt. Gen. Glenn Walters, deputy commandant for Programs and Resources, told reporters in early March. While Davis said getting parts for aging aircraft like AV-8B Harriers is top on his priority list, so are parts for brand-new planes, like the F-35 joint strike fighter. Davis said he is most concerned with making sure that F-35s and AV-8B Harriers have all the spare parts they need. "We've got these great, brand-new airplanes but sometimes we don't have the parts we need to get to full readiness," he said. Seeing newer aircraft with mission-capable rates as low as some of the Marine Corps' oldest planes or helicopters is a red flag, said a retired Marine pilot and Iraq War veteran, who spoke on the condition of anonymity since he works in the aviation industry. That includes several critical aircraft that Marines fly, like the new versions of the Super Cobra or Hercules. Mission-capable rates for the AH-1Z have fallen from 74.2 percent to 52.2 percent between fiscal years 2009 and 2015. During that same period, mission-capable rates for the KC-130T fell from 70.7 percent to 68.1 percent. Marines watch as an MV-22 Osprey lands during an aircraft and personnel recovery training mission in California. While Marines are known for doing more with less, Burns said it poses challenges when with Marines they identify needed repairs, only to find they're competing with everyone else in need of the same parts. "We can realistically only look Marines in the eyes so many times and ask them to do one more thing for America, knowing that unless something changes, we will just be asking them again," she said. "Ingenuity only gets us so far, however, we are equipped to fight our current battles, but our units at home who are on the bench are hurting the most." At a time when the service is trying to retain its top talent amid an improving economy, those types of frustration can drive Marines out of the Corps. Marines who completed an annual retention survey last year cited a lack of job satisfaction as the fourth-highest reason for wanting to leave the Corps in 2015, up from the No. 6 spot in 2014. The reasons behind the steep declines in mission-capable rates can vary widely by aircraft, according to officials at Fleet Readiness Center Southwest at Naval Air Station North Island, California. 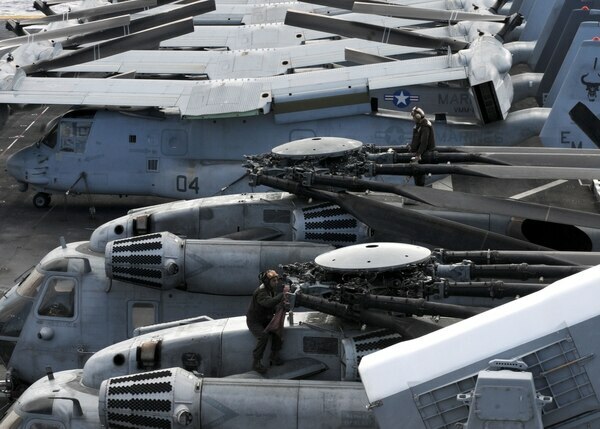 About 30 percent of the center's workload is devoted to repairing Marine aircraft. F/A-18 Hornets require the most maintenance due to its age and frequent support in accomplishing naval and Marine Corps missions, said Mike Grice, the systems engineering department head there. Hornets are susceptible to cracks and corrosion, he added. Since the CH-53E is an aging helicopter that is out of production, there can be delays and that can cause delays in getting needed parts, said John Olmstead, a spokesman for Fleet Readiness Center East at Cherry Point, North Carolina.​ They are sometimes required to make certain parts in-house, he said, which can take a while. The situation became dire whensteep budget cuts known as across-the-board spending cuts known as sequestration hit in 2013, Olmstead said. The readiness center was not able to hire replacements for artisans who retired or took jobs elsewhere, and it could not order badly needed maintenance materials or spend money to fix equipment at the center, he said. "This meant no preventive maintenance on plant equipment. That led to many machines being down for extended periods of time," Olmstead said. "This inhibited our ability to produce parts, further slowing our turnaround time. Both issues continue to impact our throughput and cost." The retired Marine pilot who works in the aviation community said he's particularly concerned about readiness rates for the CH-53E. 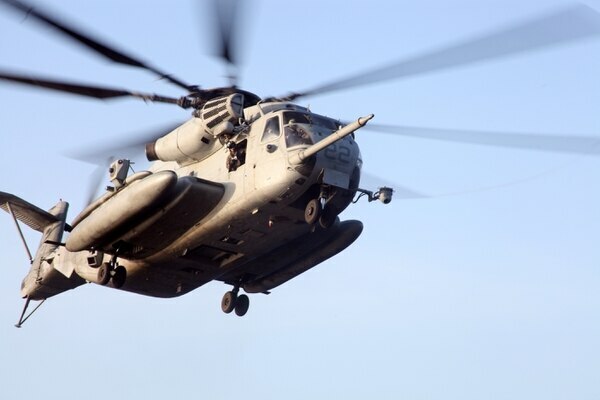 The heavy-lift helo is a workhorse for the Marine Corps, and the mission-capable rates, which dropped from 63.6 percent at the end of fiscal 2009 to 46 percent at the end of 2015, "look horrible," he said. A retired pilot and Iraq veteran said those mission-capable rates are a troubling if not terrifying one for the CH-53 community. "The [mission-capable] rate should be 70 percent," he said. "...The full mission-capable rates should be about 50 percent. They're not hitting it. They're not coming close to it at all." He recalled that his Marine Heavy Helicopter Squadron was at 70 percent full-mission capable when it deployed to Iraq about a decade ago. At the end of 2015, the helo was at was at 50 percent. The pilot said he believes the problems with that aircraft are unique, stemming from a lack of funding for repairs, maintenance and spare parts that predates sequestration. When the threat of sequestration first hit in 2013, then-Commandant Gen. James Amos and his top adviser for the budget at the time, Lt. Gen. John Wissler, warned different audiences in Washington about the possible fallout. Amos said at the time that "only two-thirds of our aviation combat units will be at readiness levels required for overseas deployment; decreased readiness will compound in 2014 and beyond." Wissler said entire F/A-18 fighter squadrons could be shut down. Fewer available aircraft would mean less flight time for pilots — and if Marines weren't training to fly, he said they could become a liability. Harmer, the retired Navy commander and former Seahawk pilot instructor, said Congress has forced the military services to cut training and operations budgets because they were not allowed to take money from elsewhere, such as pay and benefits. "This is a problem the Marine Corps itself cannot address," he said. "The president and Congress have committed us to an operations regime overseas and not financed a training regime for stateside, and then basically said to the Marines, 'You guys figure it out.' There's nothing to figure out. There's no way for the Marines to reallocate funding that just isn't there." Lance Cpl. Moses Roman, a tiltrotor mechanic, replaces a blade on an MV-22 Osprey. Marine leaders and members of Congress are concerned about the state of the Corps' aircraft. While lawmakers have taken steps to ease the sequestration cuts since 2013, neither Congress nor President Obama seem willing to permanently fix the damage sequestration has done to readiness. As things now stand, the Marine Corps does not expect to return to optimal aviation readiness levels until at least 2020 — assuming the service gets all the money it needs between now and then, Paxton told members of the House Armed Services Readiness Subcommittee on March 3. But the Marines may have to face another budget shock. Unless lawmakers reach a compromise, sequestration spending levels will return in fiscal 2018, when a two-year budget deal expires, said Jesse Sloman, a research assistant with the Center for Strategic and Budgetary Assessments think tank in Washington, D.C.
That would sink the Marine Corps' plan to fix the damage to aviation units by 2020, Sloman said. "If we went into another sequester, I think it would be disastrous," he said. Commandant Gen. Robert Neller has called aviation readiness his "No. 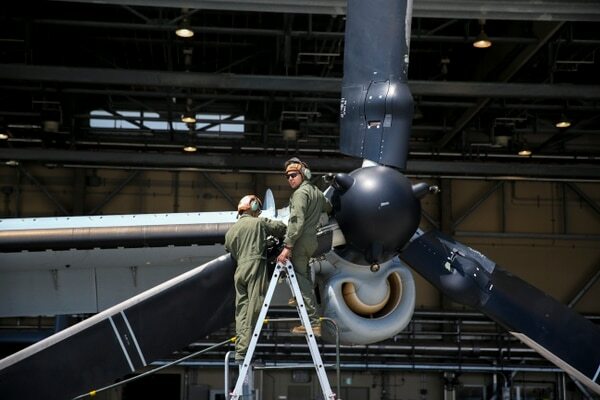 1 concern," but said it will take a couple years for the Marine Corps to get more flight hours for pilots and enough spare parts for maintainers to keep planes and helicopters in the air. For right now, Congress needs to provide more funding to the Marine Corps and other services so they keep aircraft flying, said Virginia Republican Rep. Rob Wittman, chairman of the House Armed Services Readiness Subcommittee. "It requires that we fully fund readiness accounts … that include flying hours, that include parts and inventory of parts, including maintenance schedules and maintainers," he Wittman told Marine Corps Times. Past experience has shown that when defense budgets are cut, spare parts become harder to come by and mission-capable rates decline, Wittman said. "When you don't have those resources, you have to prioritize and there are fewer aircraft that are available," he said. "Sometimes, in order to get critical parts, you do need to go to other aircraft." If Marine units aren't in the lineup to deploy, they have the hardest time getting spare parts, Wittman said. "We've seen that happen in the past," he said. "We've seen it every time we go through a reset, whether it's back post-Vietnam War, post Carter administration, wherever we may be. All of us want to believe that the lessons have been learned and we don't need to repeat that." Gidget Fuentes contributed to this report.